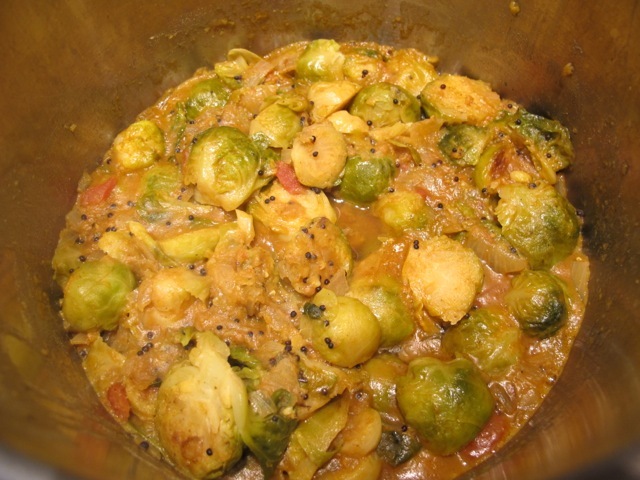 Spicy red lentil dal with brussels sprouts. Meredith has been doing the shopping the last few days as I stay in the warm and “get better” from a viral cold. I’m beginning to think this is a great idea. A large bag of Brussels sprouts was one of the items a couple of days ago. I looked in Health Eating for Life–I’m cooking from my new book!–and spotted this recipe. 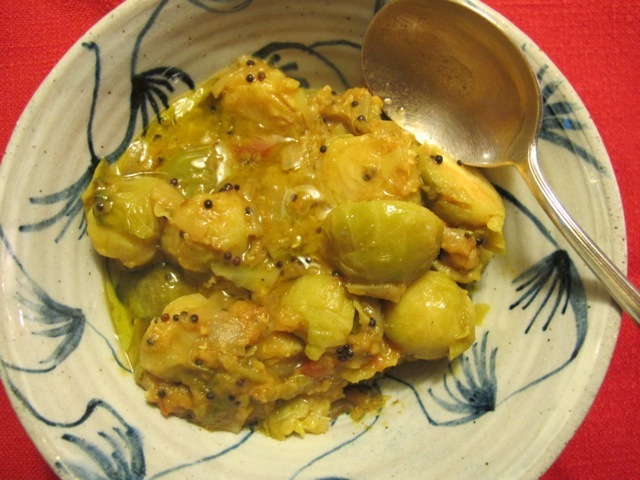 In the book the recipe calls for cabbage–but I thought brussels would be a workable substitute. The original recipe in Julie Sahni’s Classic Indian Vegetarian Cookery and was adapted by Rose Elliot. I have tweaked it a bit further…. It was more-ish and insulating on a “naughty December night” and would have been even better if we’d remembered the lemon! Put them in a saucepan with the stock and the turmeric and bring up to the boil. 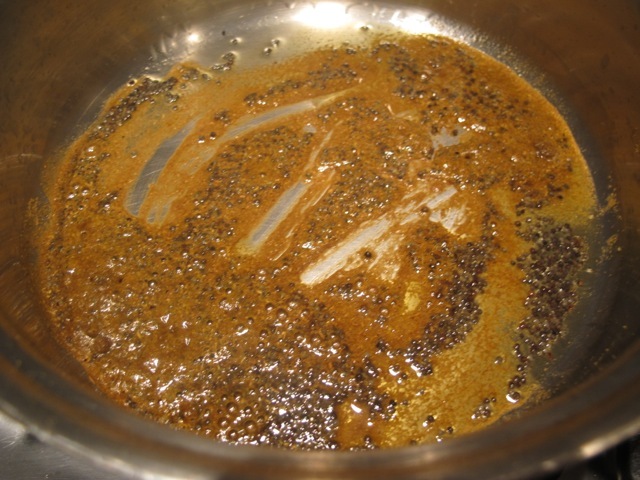 Cook at a gentle simmer for 45 minutes. Add the chopped tomatoes, then set aside. Heat the oil in a new pan. Add the mustard seeds and cook them until they start to pop–a couple of minutes. Mix in the curry powder and let them cook for a few seconds. Add the onion and the sprouts and mix everything together well. 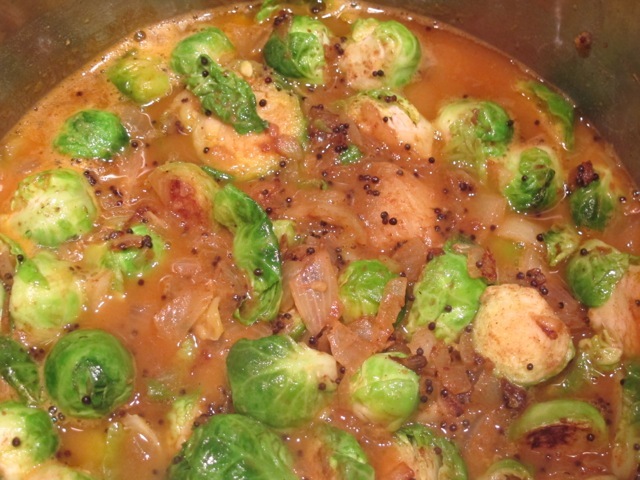 Add the sprouts and onions to the lentils. Bring the mixture up to the simmer. Leave it simmering gently for 20 minutes. * Ready, Steady, Cook is a half hour TV show that pits two chefs, each with a member of the audience as sous chefs, against each other and the clock to cook from scratch the random contents of a bag of shopping. This looks like a brilliant recipe. Would love to try it, but will have to wait until my beloved hubby is out of town for a week.. he’s so terribly allergic to mustard! I got a cold, too! Ola is in Norway, but incredibly I have all the ingredients with me! I will try it tomorrow! It looks delicious! Dear Robin, Hope you get better soon, keep the chest warm and have lot of rest.Wishing you, Meredith and the lovely cats & animals a Merry Christmas, big hughs xxxx from Chantal & Puske-puske. Thanks Chantal–same good wishes to you! Robin, I am fairly ignorant about lentils. Other than for color, how would you choose among red vs. green vs. brown lentils when cooking? Red dissolve into a mush quickly as in this recipe. Flattish light green keep shape a little longer and slate/grey/green hold their shape. Horses for courses. Depends on the recipe. Usually a recipe will describe what to use. on December 24, 2013 at 3:02 am | Reply Dianne P.
Hi, Robin! Mmmmm–this sounds good! Will have to put brussel sprouts on my next shopping list. Just finished buying ingredients for Christmas dinner for 17 people. Tomorrow, we finally put up the tree! (Just a little late this year.) Wanted to wish you and Meredith and the kitties a very Merry Christmas — sent along with the help of a few mutually-admired musical legends. Enjoy!! Cheers & Hugs for the Holidays (and always)! Thanks and the same good wishes to you Dianne and Gene. Merry Christmas to you both.Wishing you love ,peace and happiness in 2014. PS. Just wondered what your thoughts might be on Max Irons as the new Poldark ? He was amazing as Edward IV in White Queen.? I don’t know enough of his work, Shirley! Thanks Judy–Bonnes Fetes to you too! Absolutely it would work, Deborah–go for it! Merry Christmas!